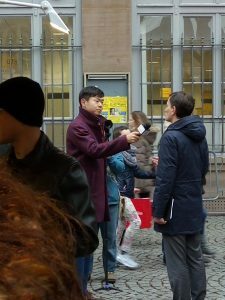 Enver Xin, an MA Translation student from China, gives a flavour of the trips across Europe that she took advantage of during her holiday time at the University of Exeter. Last December, my friends and I went to France, Switzerland and Finland during the Christmas holiday. 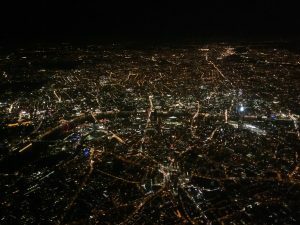 This was my first time travelling around Europe. I was so excited, and I wrote some travel journals during our journey to record my experiences and feelings. Now I want to share some of them with you! 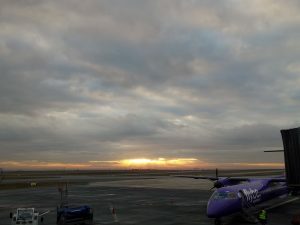 We took a flight from Exeter airport directly to Paris airport. This was very convenient because we didn’t have to go to London and queue through Customs which sees thousands of people every day. We took a tube from the airport but got lost in town. 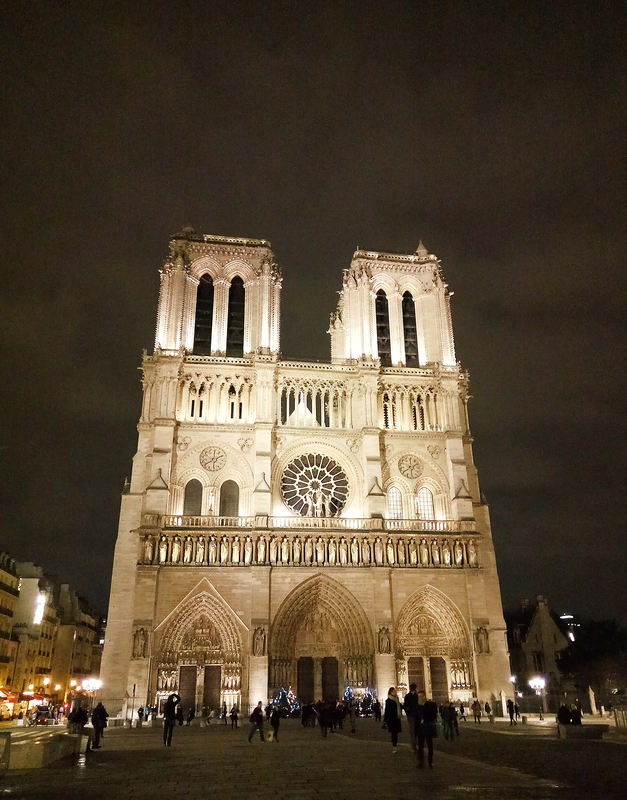 After turning left at a corner, there was Notre Dame de Paris, and the bells in the cathedral rang at that time. What a beautiful surprise! For dinner was the famous French cuisine, Duck confit. It is considered one of the finest French dishes. It is cooked in its own fat, and then the fat is removed, so the duck is healthy, served with crisps and some vegetables. As for the snails, in French cuisine, the snails are typically purged, killed, removed from their shells, and cooked (usually with garlic butter, chicken soup or wine), and then placed back into the shells with the butter and sauce for serving. They are high in protein and low in fat content, also very delicious. We went to the Triumphal arch on day 2. The weather was so sunny that everything looked gorgeous. 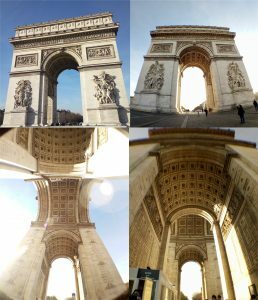 The Arc de Triomphe honours those who fought and died for France in the French Revolutionary and Napoleonic Wars, with the names of all French victories and generals inscribed on its inner and outer surfaces. Beneath its vault lies the Tomb of the Unknown Soldier from World War I. The Eiffel Tower was constructed for the 1889 World’s Fair, it should have been torn down after the Fair, however, French people liked it so much that it remained and has now become a global cultural icon of France and one of the most recognisable structures in the world. 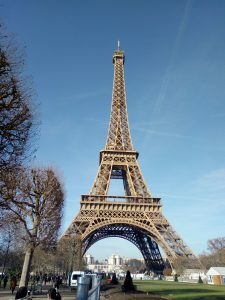 We were lucky to have such pleasant weather that day, and the Eiffel Tower looks splendid, but the Tower was under maintenance, and we could not get to the top of it. What a pity! This is one of the reasons that I want to go back to Paris again. 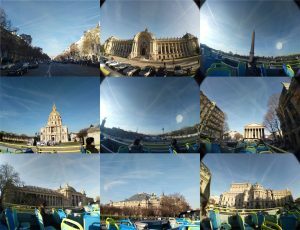 Paris is a very large city, and we wanted to see as many famous buildings as possible, so we bought bus tour tickets and let it take us around the city centre. The bus also had an electronic explanation system, and everyone can select their own language and listen to the introduction of each of the sights. It was so great; however, it was very cold in winter. Versailles was the seat of political power in the Kingdom of France from 1682, when Louis XIV moved the royal court from Paris until the royal family was forced to return to the capital in October 1789. The front gate looked gorgeous with the gold shining in the sun. We took a little train to travel around Versailles. We were not able to go into the main building of Versailles, so we went to the Grand Trianon and the Petit Trianon. I love the scenery in Petit Trianon so much. It was at dusk, and everything looks gentle but mysterious. The Petit Trianon was for Queen Marie Antoinette’s personal use and enjoyment. There are many fields and they still have vegetables in them. 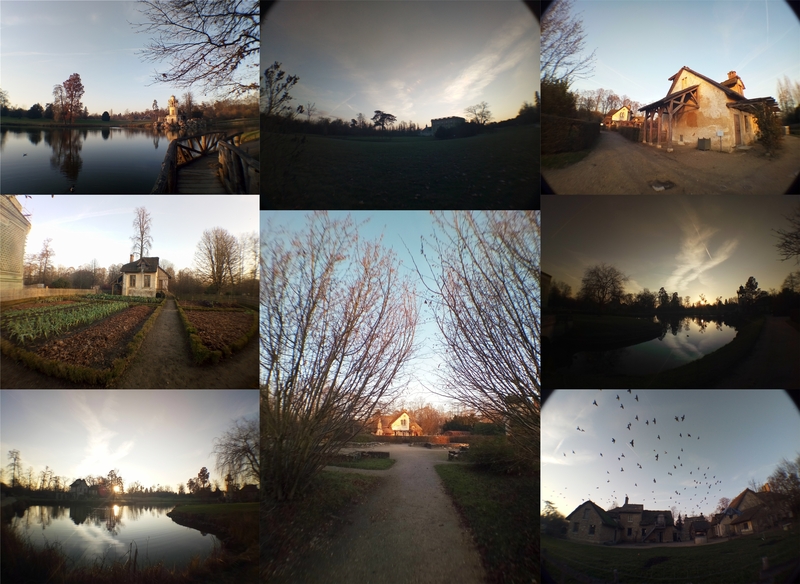 As I walked through those little pathways, I started to understand why Marie Antoinette came to the Petit Trianon to escape the formality of court life. 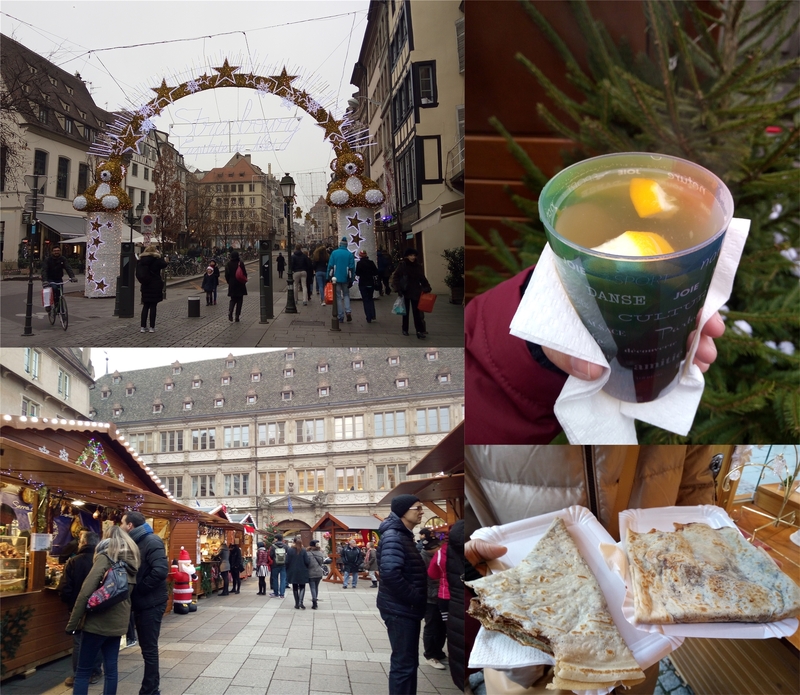 On day 4, we went to Strasbourg to visit the Christmas market which was known as one of the most famous Christmas markets in the world. 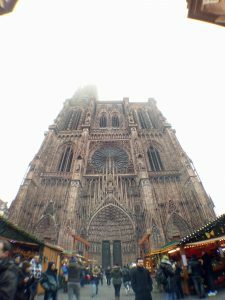 It was a foggy day, and the Strasbourg Cathedral looks very lofty. It was in Strasbourg in 1570 that the very first edition of the oldest Christmas market in Europe took place, then called the “Christkindelsmärik” (market of the Infant Jesus). This was my first time at a Christmas market, and everything seems to attract me. The hot white wine had orange pieces in and was so delicious. This was also my first time eating a crepe. I loved the taste. A funny thing was that we happened to meet a reporter from China Central Television. Suddenly we felt a feeling of being at home in that foreign country. Finland was our last stop. 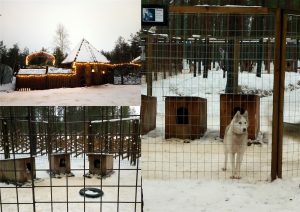 We entered the Arctic Circle to visit Santa Claus and to see the aurora. 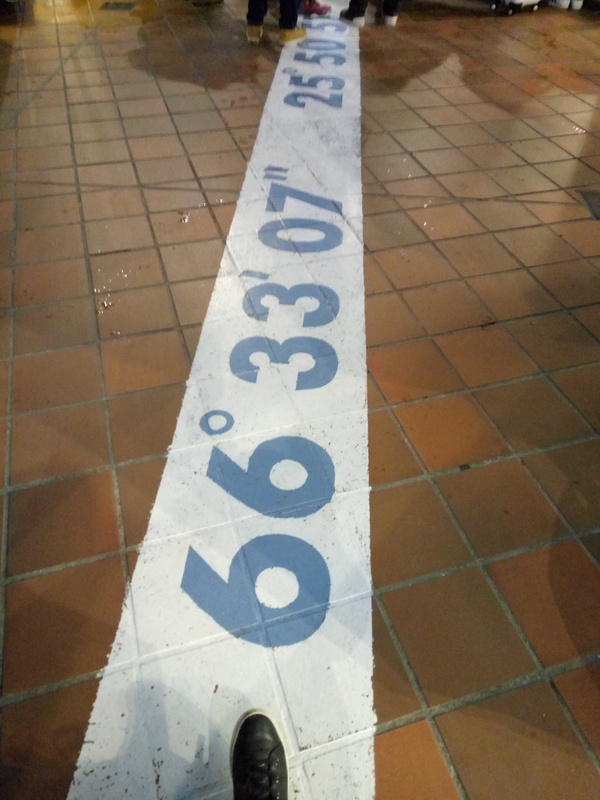 The above picture is my foot on the border of Arctic Circle. Santa Claus Village is an amusement park in Rovaniemi in the Lapland region of Finland. You can find everything about Christmas there. We spent an entire day there shopping and playing around. Everyone can take a picture with Santa and get the electronic version online afterwards. Santa was so nice, and he can even speak a little bit of Chinese! It was so sweet. 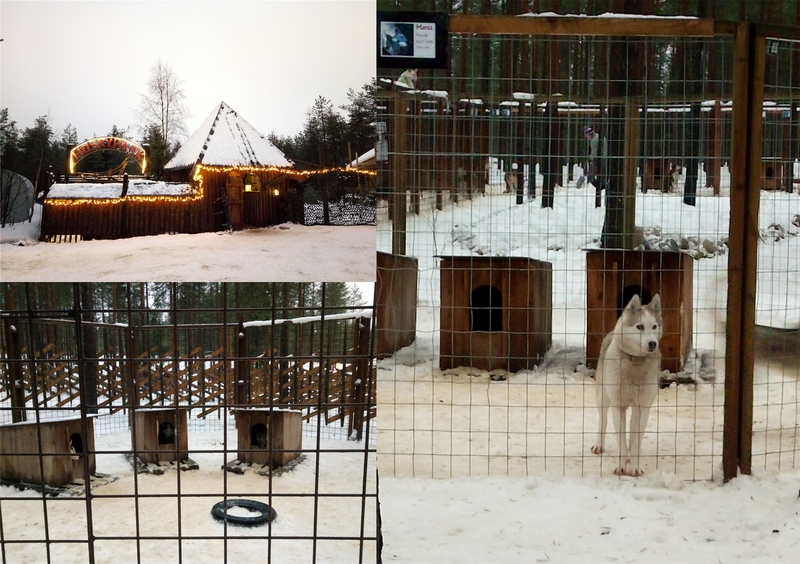 After taking a picture with Santa, we went to the Husky park. Those Huskies are very cute and lively. I’m a little bit terrified of big dogs, but these ones were luckily very obedient. Some of them had very beautiful fur, like in the pictures below. If you go to Rovaniemi in winter, you should try either the Husky ride or the Reindeer ride. 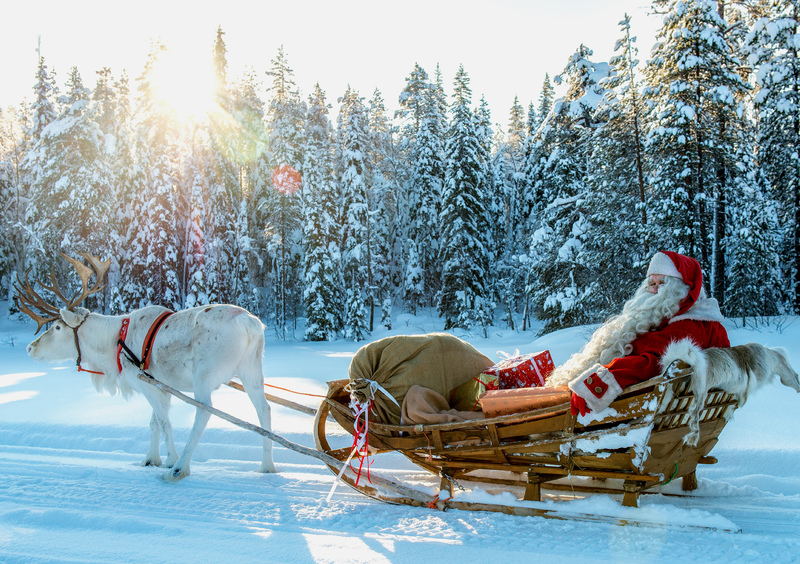 These two are the must-do things in the Santa Claus Village. 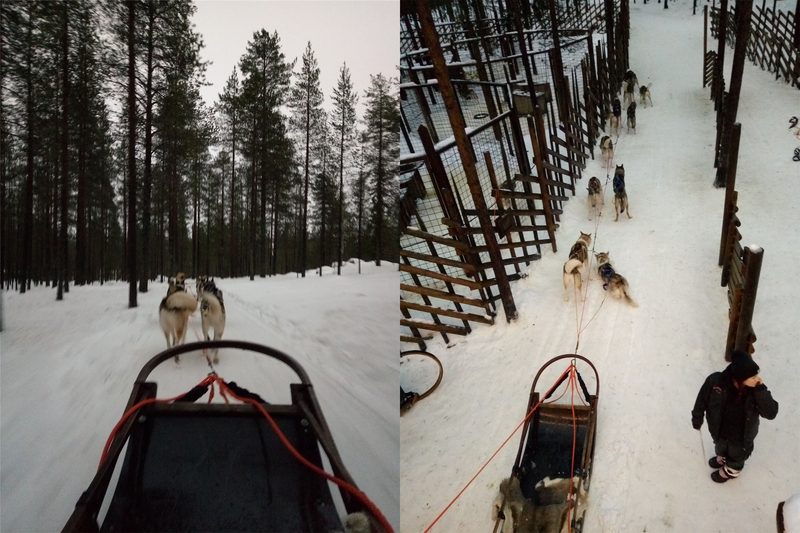 It was my first-time riding in a husky sledge, and it was so exciting and thrilling. I hope I can go back there in the future and take the husky ride again. We planned to see aurora at night on day 5. However, there was a snow storm, and we didn’t get to see it. We only stayed in Rovaniemi for 1 night, so sadly I didn’t have another chance to find the Aurora. This was my greatest regret of the journey. But I saw many things that I never had the chance to see before, and this was the first time I travelled around Europe, so this trip was already a success. 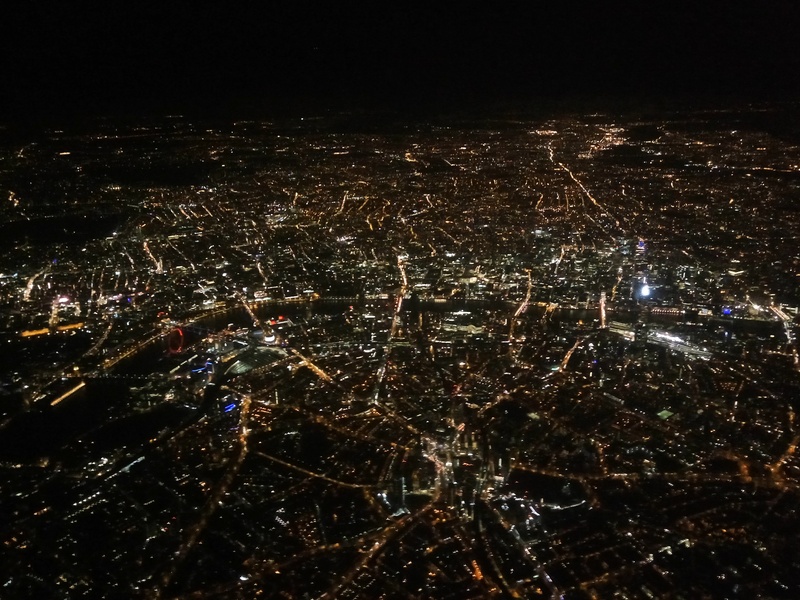 The air view of London on my return flight was too beautiful to express in words. From this picture, you may find some famous spots of London, such as The Big Ben, The London Eye and so on. 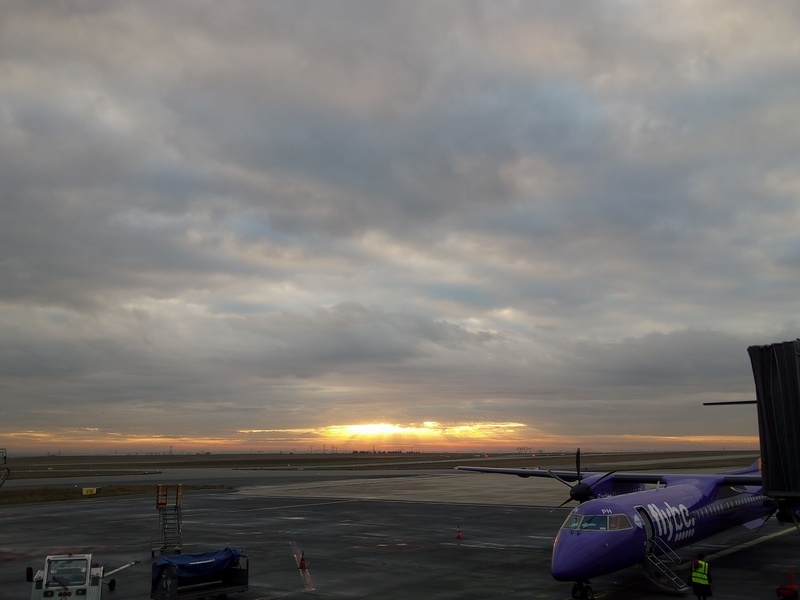 I hope I can travel on more trips abroad again in the near future. This entry was posted in Humanities, Students by Site Administrator. Bookmark the permalink.